Did you note the difference? I’ll give you a second to look again. Omeprazole was brought to market by (what is now) AstraZenica in 1989. It is used in treatment of gastroesophageal reflux desease (GERD, commonly known as acid reflux). It is a proton pump inhibitor which works by blocking the production of gastric acid by parietal cells. It was a blockbuster drug. In the year 2000 alone, omeprazole made $6.26 billion. But in 2001, omeprazole’s patent was set to expire. AstraZenica needed something to fill their pipeline, so they looked at their data for omeprazole. Omeprazole is an example of a little-known class of chiral molecules where the stereogenic atom is not carbon. We typically think of stereocenters with carbon as the central atom. But this is an example of a stereogenic sulfur atom (in case you’re wondering where the fourth ‘thing’ bonded to sulfur is, it is a pair of electrons. See the explanation of chiral sulfoxides for more information. Ellman’s chiral auxiliary is a good example of chiral sulfoxides in use). Omeprazole is a racemic mixture: an equal mixture of (R) and (S) enantiomers. In looking at their data on omeprazole, they noticed that the (S) enantiomer was more potent than the (R) enantiomer (according to this website, 4 times more potent). So in 2001, AstraZenica prepared and won FDA approval for enantiomerically pure (S) omeprazole, which they called… esomeprazole. Very creative. So in 2001 when omeprazole lost patent protection, esomeprazole came to market. In theory, you should be able to take a smaller dose of esomeprazole to achieve the same efficacy of omeprazole. Indeed, the top suggested dose of omeprazole is 80 mg, and the top suggested dose of esomeprazole is 40 mg. The only difference between the two drugs is the optical purity. Omeprazole is a racemic mixture, and esomeprazole is optically pure (S) enantiomer. So while I’m no health care professional (and my opinions should not be taken as such), it seems to me that if you’re taking prescription esomeprazole, you should ask your doctor if a higher dose of omeprazole (which would be cheaper if you get the generic version) would work just as well. 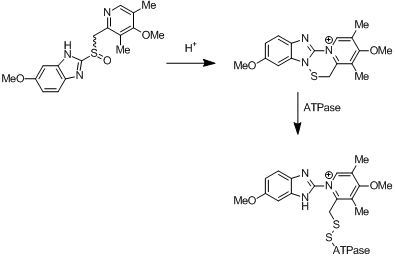 Note that the tetracycle is achiral – it has no stereocenters, sulfur or otherwise. So whether you take the chiral esomeprazole or the racemic omeprazole, both are converted to the same achiral tetracycle. Again something to note if you’re taking the optically pure version of the drug. Also, another interesting piece of trivia: omeprazole competitively inhibits the CYP2C19 and CYP2C9 enzymes. Other drugs – like warfarin and diazepam (valium) depend on these enzymes for metabolism. As a result of the competitive inhibition, these drugs cannot fully metabolize. The effective concentrations of these drugs is increased. People taking warfarin or diazepam should be warned if they are planning on taking omeprazole. So now you know: omeprazole and esomeprazole are effectively the same drug. I’m not sure why one would take prescription esomeprazole when omeprazole is available (over the counter in most places). I understand omeprazole sometimes has more side effects than esomeprazole in some patients, so if that’s the case, so I get taking the drug which minimizes side effects. Make sure you also read this interesting article written in 2002 about the history of omeprazole. many thanks for this highly interesting post! So presumably, whatever converts omeprazole or esomeprazole to the active tetracyclic drug does so in a stereoselective fashion – an enzymatic kinetic resolution that’s occurring in vivo. Thanks for the link. Here’s another from J. Chem. Ed. called ‘When Drug Molecules Look in the Mirror.’ It talks about the negative side effects of some enantiomers of drugs. It’s a quick, interesting read. On the warfarin issue, to a first approximation *everything* interacts with warfarin. People taking warfarin already know that any diet or medication change is going to screw with their warfarin dose. Since the anticlotting effect has to be tuned pretty carefully this means a lot of measuring clotting times and adjusting doses. If the dosing was more predictable across time and across people, warfarin would be a wonderful drug. Also interesting to note, non-carbon chiral centers have the potential of spontaneously changing chirality because electrons are so easy to relocate. That is the reason that Thalidomide is on the market as a racemic mixture even though one enantiomer causes prenatal phocomelia and the other is therapeutic. The chiral nitrogen switches back and forth in-vivo. Sorry, dude, nitrogen is not the chiral center in thalidomide. The carbon atom is. If both R and S enantiomers are converted to the same thing, why is esomeprazole more active than omeprazole? Rate? Jim, I think it may be that both enantiomers can be converted to the same intermediate, but one happens to fit a little better in the binding pocket so the rate of conversion for that particular one is much faster. But I’m not an expert so don’t take my word for it, I’m purely hand-waving. J-Bone, that’s also what I am speculating. There should be some literature related to this. True. The way AZ bamboozled us is by demonstrating the efficacy of Nexium not over omeprazole but over Prevacid (lansoprazole), a completely different drug. That was the sleight of hand. They are not the same drug because even though they both convert in the same chiral compound, the don’t do this at the same rate in people, due to its genetics and the enzymes expressed. Some people are called slow metabolizers while others rapid metabolizers. A pragmatic writeup on Omeprazole. Actually I am suffering from gastroesophageal disease, and was wondering for one stop solution,after reading this post,I will implement as my solution. Keep sharing such posts like this with us.